Let’s channel "The Name of the Rose" during a very special visit of the monasteries of Subiaco, in the Province of Rome. Come with the CCR on a springtime trip, with guided tour in English, to the Monasteries of St. Scholastica and St. Benedict in this ancient hilltop town. The religious order founded around 500 AD by St. Benedict grew around a cluster of twelve monasteries. 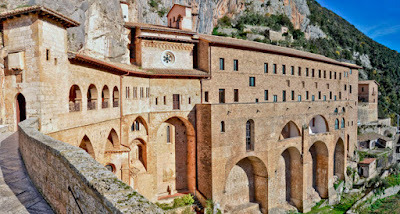 The Monastery of St. Scholastica is the only one of those first twelve to survive, thus making it the oldest Benedictine monastery in the world today. It boasts a lovely Cosmateque cloister, a frescoed church, and a medieval bell tower. 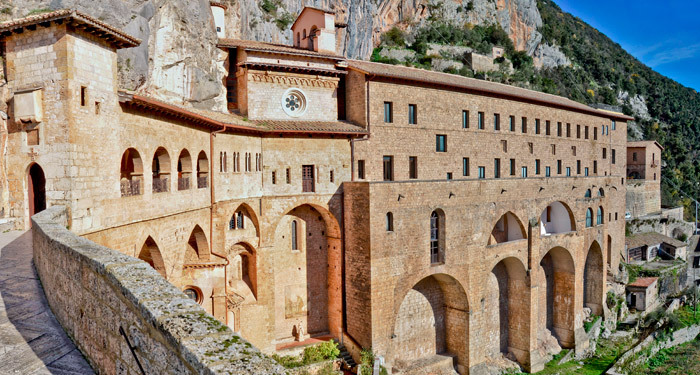 The monastery named after the founder of the order, the Monastery of St. Benedict, was built in the XII century over the cave where Benedict had been a hermit for three years. Once again, astounding frescoes cover the walls of monks' cells and chapels, including the earliest known image of St. Francis of Assisi, a living portrait dating to his retreat here in the early 13th century. During its history, the monastery survived floods, earthquakes and the scandalous behaviour of certain monks until its monastic community was reformed in 1363, including the arrival of religious brothers from other parts of Europe. Among these were Germans in the XV century who brought the new art and technology of the printing press, making the Lazio Region the heart of printing in Italy for centuries. Not only will participants be able to discover the mysterious and sacred areas of the monasteries but they will also admire the recently restored Chapel of the Angels, the Refectory and the magnificent library with unique manuscripts from the medieval era. After our visit which will last approximately 3.5 hours, a lunch will be hosted in the “Foresteria” -- or guesthouse -- of the monastery complex. Transportation, Meeting Point & Timing: By car (please carpool). Meet in the parking lot of San Benedetto (this is the abbey that is the one further up from Santa Scolastica) by 8:45. Confirmed participants will be sent further information regarding the meeting point. Cost: for the two visits €15 per person; €20 for lunch for adults, €14 for child menu. Advance payment is required. NB: Book early as space is limited and remember that you are financially responsible for your booking. RSVP to Marielle at canadarome@gmail.com, specifying whether you would also like to come to lunch; also, please indicate whether you need help finding a lift or rather have room in your car to offer a lift to others.